While you can visit Colca Canyon on an organized tour or hire a guide, it’s venturing down there independently that provides the most satisfying experience of the Canyon’s splendor. We wrote and published the original version of this guide to trekking Colca Canyon without a guide or a tour after our visit in May 2014. At the time, we found all of three blog posts to help us plan the trip, so we wrote our own guide as a way to help all those who come after us. We keep this Colca Canyon hiking guide up to date, checking for and adding the most current information we can find. This is the June 2018 edition of the guide, its 3rd, completely reorganized and rewritten from last year and updated with the latest information. We hope you find it helpful. If the unlikely event you find any inaccuracies, please email us or comment below the article. Get this guide as an ebook for ONLY $0.79! World’s second deepest canyon, about twice as deep as the Grand Canyon at 3,270 meters / 10,730 feet, Cañón Del Colca is located 160 kilometers / 99 miles northwest of Arequipa, Peru. Named after qolqas, granaries built into mountainsides, the Canyon is about 100 kilometers / 62 miles long. 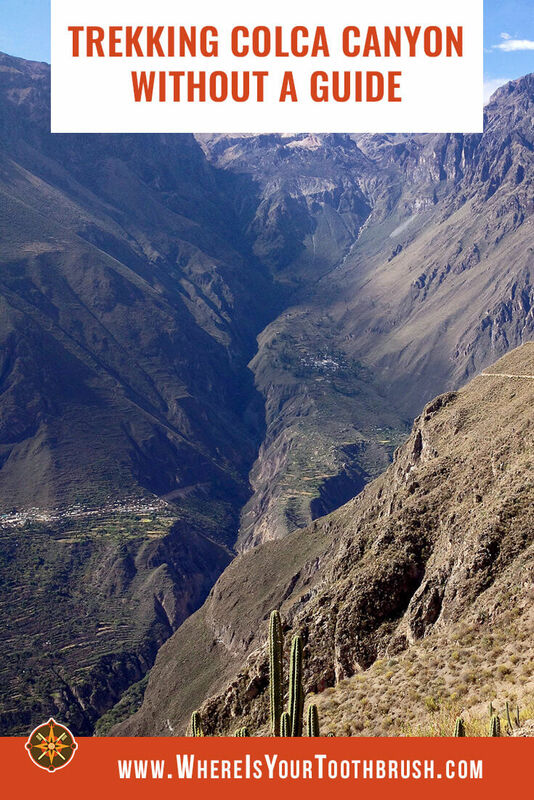 The trekkable portion of Colca Canyon covered in this guide is roughly in the Canyon’s middle section. While the Canyon has been inhabited for about 1,000 years, trekking here began in the early 1980’s; tourists started arriving in the 1990’s. Aside from the stunning natural landscape, visitors enjoy watching giant Andean Condors soar over the Canyon, wildflowers bloom, terraced farms cascade down the hillsides, village life pass, and indigenous Quechua culture survive in nearly unchanged forms. One of world’s biggest flying birds, the Andean Condor is one of the main draws of Colca Canyon. The best place for condor watching is Mirador Cruz del Condor, between Chivay and Cabanaconde. The spot is easy to skip if you are bussing directly to Cabanaconde (see Getting around). Add an extra day or take a very early, i.e. 1:00 a.m. bus, deboard, and either hike 2 hours or take the next bus to Cabanaconde. Alternatively, you can do this on the way back. From inside the Canyon, specimens hover in the distance high above like tiny black crosses. The Colca Canyon area is drier and hotter than other parts of Peru. Rainy season, such as it is, lasts approximately from December to March, with February being the wettest. We do not recommend trekking Colca Canyon without a guide (or with one, for that matter) in the rainy season. Consider safety, as there’s a possibility of flash floods and landslides, and comfort. If you do come during this period, pack a poncho, water-proof shoes, and an extra change of clothes. The rest of the year, the Canyon is dry and hot, though temperatures drop dramatically at night. The best period to visit Colca Canyon is April thru June. 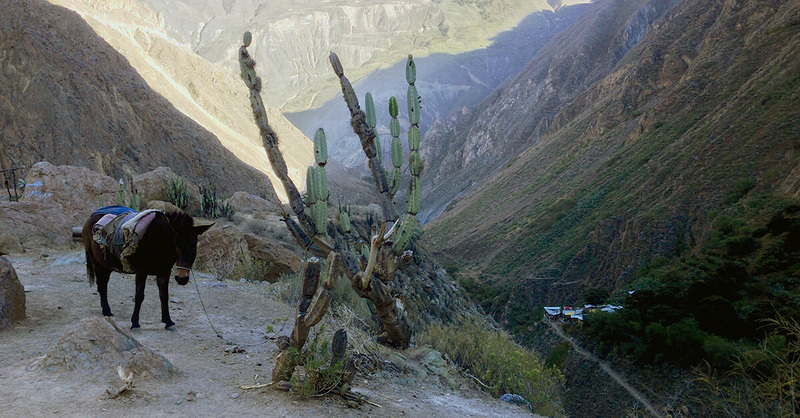 Set out on your daily hikes in Colca Canyon as early as possible in the morning. There are few trees or shelter to provide shade; by 11:00 a.m. the place is scorching. Bring or buy a lot of water. Hiking in Colca Canyon on your own is not only a more economical option, it’s more scenic and adventurous. A 3-day/2-night trek in Colca Canyon by yourself costs a fraction of what a tour company may quote for a 1-night stay sans trekking. For example, in 2014 we trekked three days and spent two nights in the Canyon for S/255 (USD77.70) per person, including entry fee, transportation, accommodations, and meals, while a popular tour company wanted S/480 (USD146.20) for a one-night visit inside Colca Canyon. In addition, some tour companies only dispatch tours when they reach a minimum signup quota, so even if you are ready to buy, the tour may not happen. 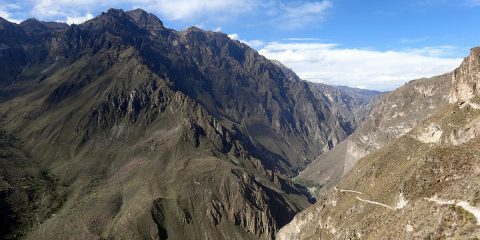 In short, trekking Colca Canyon without a guide beats the alternatives, particularly if you love hiking. Water, beer, and snacks can be as expensive as an entire home-cooked meal. Hiking boots. Not sneakers, not mere hiking shoes. Whether you will be hiking Colca Canyon without guide or with one, the trails are uneven and ascents/descents difficult. Hiking poles. Recommended for descents. Water. You can buy bottles in the villages but pack extra. Wide brimmed hat and sunscreen. The sun is brutal, do yourself a favor. Headlamp or flashlight. To access shared bathrooms at night. Toilet paper. Just do it. This guide. Download it to your smartphone/tablet or print it out. There is no wi-fi, except spottily in Sangalle. Colca Canyon is located at a high altitude. Take basic precautions before hiking here. Spend a few days in Arequipa first or add a night in Chivay. Take it easy on your trek, pause and drink water often. Be sure to protect yourself from the scorching sun (see Packing list above). While hiking through Colca Canyon, keep to the middle of the path; loose rocks on the edge and uneven hillside terrain pose risk. Be aware of uneven ground on dirt paths. Particularly when headed down into the Canyon, proceed slowly, look under your feet, and keep your knees bent. A pair of hiking poles is recommended. If you decide to admire the views, stop. If you encounter donkeys, scoot toward the landmass, never to the edge of the trail. The greatest danger is falling rocks and landslides or rock slides. The key is to remain vigilant. Watch for falling rocks and for tremors announcing an imminent rockfall. If you do get caught under a rock fall, step away from the trail edge toward the mountain, pull your backpack over your head for cover, and if possible hide under or against a large rock. If you encounter a trail buried under a small land or rock slide, walk fast over it (a path will often be already made by locals). If it looks dangerous or you hear/see signs of the slide still moving, turn back. Buses to Cabanaconde (3,287 m / 10,784 ft above sea level), a sleepy town at the edge of Colca Canyon where three principal trailheads are located, depart from Terminal Terrestre in Arequipa. Bus schedules from Arequipa to Colca Canyon tend to change so check ahead for the current schedule. The most frequently mentioned departure times are 1:00 a.m., 3:00 a.m., 5:00 a.m., 8:00 a.m. (we took this bus on our trek), 9:30 a.m., 11:00 a.m., 1:00 p.m., and 2:00 p.m. Get your ticket early for the popular “normal” morning times. To overnight inside the Canyon the same day, leave Arequipa early in the morning, as steep paths can be treacherous in daylight, let alone in the dark. Alternatively, break the trip down with a few hours in Chivay, then continue to Cabanaconde to stay the night there and hike down the next morning. The trip from Arequipa to Cabanaconde takes 5.5–6 hours, including a stop in Chivay at the Canyon’s eastern end. One way trip from Arequipa to Cabanaconde costs S/17 (USD5.20). You must have a boleto turistico to enter Colca Canyon. The ticket, valid for 5 days, is available for S/70 (USD21.30) from red-vested Autocolca tourism agency representatives on the bus to Cabanaconde or at the terminus on the town’s main square. 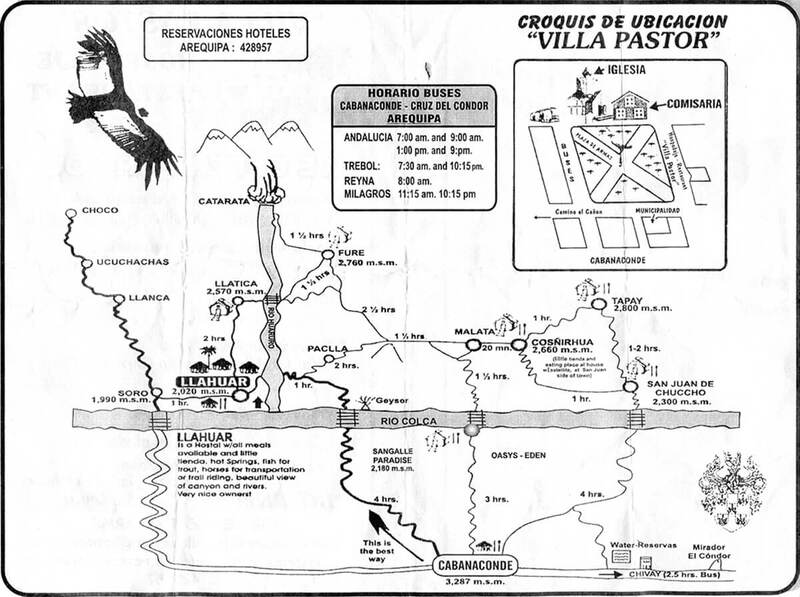 The network of trails inside Colca Canyon is simple. While there is no official map available, the map below (image courtesy of feeb) was in wide use until a few years ago. Newer maps tend to be more colorful but have the same amount of information. Regardless of which Colca Canyon trek map you end up using, most of them provide a good approximation of time and elevation changes needed to hike from point to point. If you don’t see distances, don’t worry: they’re deceptive, if not useless hiking up and down the steep slopes. If you want a paper map, stop by the Pachamama hostel in Cabanaconde and buy their 2015 Colca Canyon trekking map. All hike durations in this guide are approximate ranges. Your time will vary depending on your fitness, breaks as well as the weather. There are three principal trails down into the Canyon, all starting in Cabanaconde and all steep downgrades. If you are headed to San Juan de Chuccho, from the bus terminus in Cabanaconde’s main square, Plaza Principal, double-back along the main road to Mirador San Miquel where the trail begins (alternatively, shave some 15 minutes off your hike by asking the bus driver to drop you off at the Mirador). It takes 3–4 hours to get to San Juan. If you are headed to Sangalle / Oasis, take Calle Grau, which turns into a trail at the town’s edge. It takes 2–3 hours to get to Sangalle. If you are first headed to Llahuar, take Calle San Pedro, then Bolívar to Mirador de Achachihua, and continue on the trail past a football field and a bullfighting ring. It takes 4–5 hours to get to Llahuar. You can take a number of different multi-day solo treks in Colca Canyon, depending on the time you want to spend inside the Canyon. No matter what route you take, your trek will be unforgettable. Below find a few sample itineraries. All but one are loops, which you can take in either clockwise or counterclockwise direction. Except for Sangalle, there is no wifi or cell reception inside the Canyon. Get a PDF of this guide for offline use on your smartphone or tablet—ONLY $0.79. 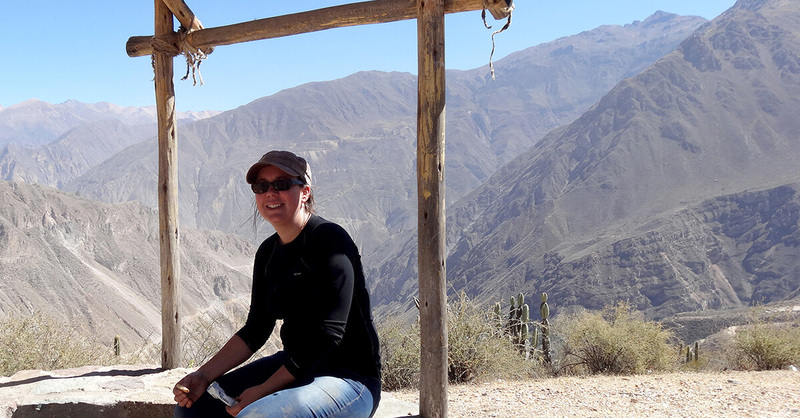 This Colca Canyon trekking guide follows Sample itinerary #1 in the counterclockwise direction (this is the best Colca Canyon trek…but only because we took it, yours may be different and even better). Simply reverse the order if you go the other way. The hike from Cabanaconde to San Juan de Chuccho takes 3–4 hours and descends almost 1,000 meters / 3,280 feet. From Plaza Principal de Cabanaconde, double-back along the main road, past a cemetery, to Mirador San Miquel where the trail begins (alternatively, ask the bus driver to drop you off at the Mirador to save 15–20 minutes). Once past the Mirador, the trail descends gently at first, then more steeply, ending in switchbacks just before Rio Colca. The views put the fear of heights to test and the descending path the knees and calf muscles. At the bottom of the Canyon, a bridge spans Rio Colca. An Autocolca tourism agency representative will check your boleto turistico. From the bridge, it’s a 10 minute easy walk to San Juan de Chuccho, a hamlet scattered in a grove of trees, providing welcome respite from the exposed hillside trails. There are a few accommodations options in the village. Reservations aren’t available online. Simply show up (few people hike in the Canyon), or ask folks at Pachamama hostel in Cabanaconde to call ahead and make a reservation for you. La Casa de Rivelino. Welcoming, if a little reserved hosts offer matrimonial (queen) beds in rustic, cozy huts with dirt floors. The shared bathroom is next to cages with turkeys, chicks, sheep, a pig, and a beautiful night sky, offering companionship. Queen rooms with shared bathroom are S/10 (USD3.05). A dinner, bottled water, and next-day breakfast, including coca tea, costs S/23.50 (USD7.20). Posada Roy AKA La Casa de Roy. Located a few minutes’ walk past Casa de Rivelino (follow the signs painted on rocks), Roy’s is much friendlier, with clean, simple rooms featuring private bathrooms with warm-ish water. Queen rooms with an ensuite bathroom are S/20 (USD6.10), S/10 (USD3.05) for rooms with a shared bathroom. 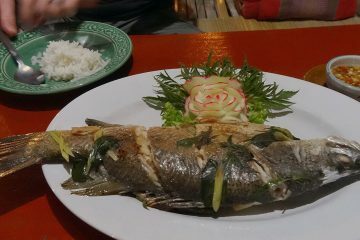 Dinner is S/10–12 (USD3.05–3.65) dinner, breakfast is S/8–10 (USD2.45–3.05). Posada Gloria AKA La Casa de Gloria. A popular, busy place to stay in San Juan Chuccho, Gloria’s offers rustic rooms, some with a shower, others communal. Rooms and dinner each cost S/10 (USD3.05). A quieter alternative for an overnight stay in San Juan is Tapay. Some 500 meters in altitude higher than San Juan, the hamlet can be especially attractive if your legs are all twisted from downhill walking and want the respite of an ascent to wrap up the day. The path from San Juan to Tapay picks up behind Gloria’s restaurant. The hike up the Canyon takes about 2 hours. Download this guide for offline use on your smartphone or tablet. With its stone gateway and paved square around the church, Tapay feels like an upgrade from villages deeper in Colca Canyon. It’s almost entirely devoid of hikers, even in the busy season. For accommodations, head to El Encanto Maruya, where simple rooms feature twin beds, electricity, and warm water in communal showers. 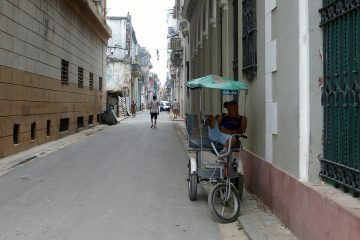 Prices are comparable to San Juan, with room, dinner, breakfast, and snacks totalling about S/40 (USD12.20). The hike from San Juan de Chuccho to Llahuar takes 4–5 hours. If you are starting from San Juan, head along Rio Colca then along the creek to the right, deeper into the side of the Canyon, and keep to the left. After this mild first section, after the bridge the trail rises steeply in a series of switchbacks. The bridge between San Juan and Malata. If you are starting from Tapay, take the downhill path to the right as you face the Canyon. The descent is steep and the path winds through many switchbacks, then levels out. Either way, you will reach Cosñirhua (or Coshñirwa), the first of several villages on the way to Llahuar, in about an hour. 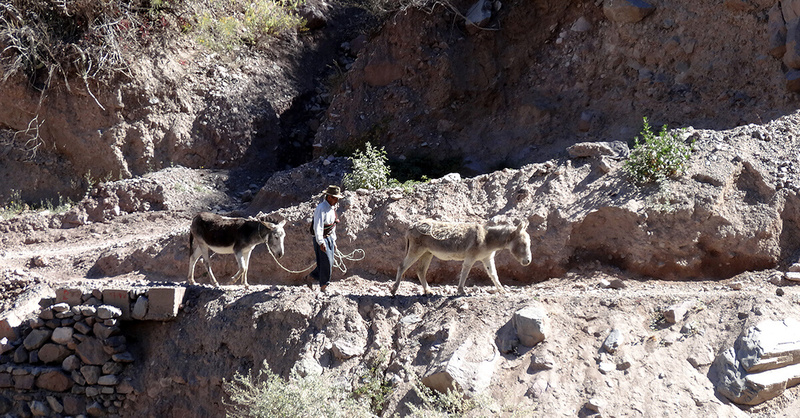 A farming village, in Cosñirhua inhabitants seem outnumbered by donkeys, chickens, pigs, horses, sheep, and dogs. Proceed for half an hour to the village of Malata, where a colonial stone church sits planted into the hillside on Plaza de Armas. If open, Malata Museo is also worth a 15-minute detour: for 1 sol a helpful guide will show you artifacts of village life. Leaving Malata, spot the trails from Cabanaconde to San Juan and Sangalle on the opposite side of the Canyon. Soon the path forks at a small clearing with a cross: continuing on to Llahuar (another 3 hours) and down to Sangalle, visible with its oasis of lush trees and pools (another hour or so; see below). Trotting further on a wide dirt road, stop at Mirador de Paclla Apacheta for welcome shade and wide-angle views of the Canyon. At Mirador de Paclla Apacheta. Straight and winding sections alternate on the dusty road. Pass the pueblos of Paclla and Pallqa, and, after several switchbacks and bends, tiny Chuwirca. Take a right at the crossroads toward Llahuar. The bridge to Llahuar soon appears below. Llahuar is a tiny settlement at the bottom of the Canyon. Aside from overnighting here, you can take advantage of the riverside thermal pools heated by volcanic activity. 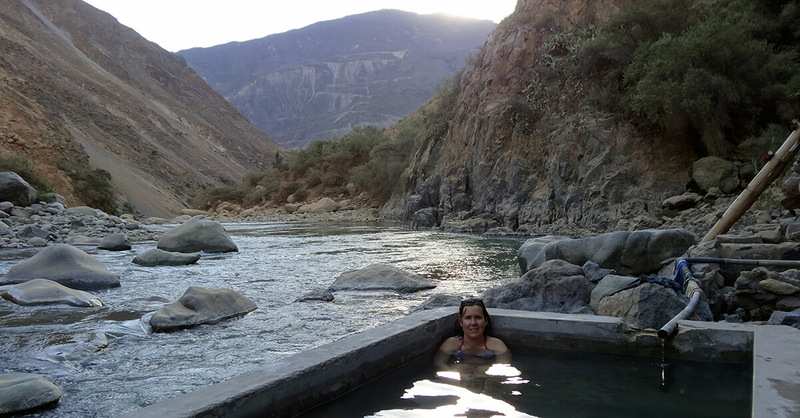 The water is far from hot but, after the long Colca Canyon trek without a guide, the soak is heavenly. Listen to Rio Colca gurgle by and watch the sun set and rocks roll down the surrounding hills. Llahuar Lodge. First in the settlement as you arrive. Popular but food quality and service have reportedly declined in recent years. The dining patio has spectacular views of the rivers Huaruro and Colca converging below. All meals at Llahuar Lodge are vegeterian, delicious, filling, made with fresh ingredients. Living quarters are in rustic huts with comfortable matrimonial beds. The bathroom is shared, but clean and functioning, though the shower can be cold. Prices are again comparable to other places in the Canyon: the room is S/20, meals are S/10 each. Best of all, the family that runs the Lodge is welcoming, warm, and helpful, making guests feel at home from the first minute. Unless it’s busy season, you can simply walk in. Otherwise book your stay ahead of time. Casa Virginia. Less busy, quieter, and slightly cheaper, Virginia’s next door is an equally welcoming family business (they do try harder since they are past the Lodge). Rooms cost the same as at Llahuar Lodge; S/15 if you don’t want to go to the hot springs. Instead of Llahuar (or San Juan de Chuccho if you are following the clockwise route), you can head down to Sangalle AKA San Galle AKA The Oasis. Shorter, 2-day/1-night treks through Colca Canyon typically include a stay here. You can also visit on a day trip from Cabanaconde, which will take about 7 hours of hiking in total and requires leaving Arequipa before dawn or overnighting in Cabanaconde. Cabanaconde, recommended if you arrive to the Canyon in the afternoon, this steep, downhill hike takes about 3 hours (up to 4 hours on the way up). San Juan de Chuccho, via Cosñirhua and Malata, which takes about 3 hours total. The turnoff to Sangalle is a few minutes’ walk past Malata. Llahuar or Fure, which takes 5–6 hours. There’s a turnoff to the right before you reach the Malata crossroads, though the path is more strenuous. Sangalle is basically a resort-like tourist trap. Because it’s easily accessible from Cabanaconde and most Colca Canyon trekking tours stop here for the night, it’s the most crowded location in the Canyon. Book your stay ahead of time; expect worse food and service and higher prices. The Oasis offers welcome shade in an oasis-like grove of trees, a number of sky-blue swimming pools, shaded in the afternoon, manicured lawns, and outdoor activities like lounging in hammocks or by the river, drinking cocktails, and playing volleyball. Many travelers reports the place is run down, making “Oasis” a generous nickname. We do not recommend Sangalle for an overnight stay but if you must: all accommodations options include a basic room (different bed options are available), a restaurant, and a pool. Prices are fairly comparable, at S/20–40, quality varies. Fure is accessible by trails from Llahuar and Malata. From Llahuar, take the trail starting outside Llahuar Lodge. In 2 hours, you will reach Llatica (2,220 m / 7,283 ft). Cross the bridge and pass a community hall and drinking-water tap. Cool off in the river before continuing to Fure. Turn left toward a plantation, and up the hill. When you reach a bridge, you’re almost there. From Malata, walk for 1.5 hours and take the marked trail up to Fure, which is another 2–2.5 hours away. If you pass Paclla, you’ve missed the turnoff and gone too far. Similar to Tapay, Fure offers a road much less hiked from other places in the Canyon. Fure Wasi. The first option when you arrive in Fure. Basic rooms in huts and a dining room. Hospedaje La Cascada De Huaruro. Rustic rooms in huts, located further into the hamlet. If you want to stay an extra night and hike Colca Canyon for one additional day, a day trip from Llahuar to the Catarata waterfalls is worth your while. The hike is a strenuous, all-day slog; the hike takes 10 hours round trip. Leave Llahuar at dawn and bring a flashlight for the return trip. Follow the directions to Fure above. After Fure, look for painted direction markers to get to the Catarata waterfall, which is a 1.5-hour hike away. The hike from Llahuar to the falls takes approximately 10 hours round trip. If you stay in Fure, the waterfalls are a 1.5-hour jaunt away. In the Llahuar not-so-hot pool. Get up early to take the 6–7-hour hike back to Cabanaconde. Double-back over Rio Huaruro toward Rio Colca. The trail descends gently along the course of the river. Before you cross Rio Colca 1.5 hours later, take a short detour to a cluster of tiny geysers, if the trail is visible from the bridge and if you have time. 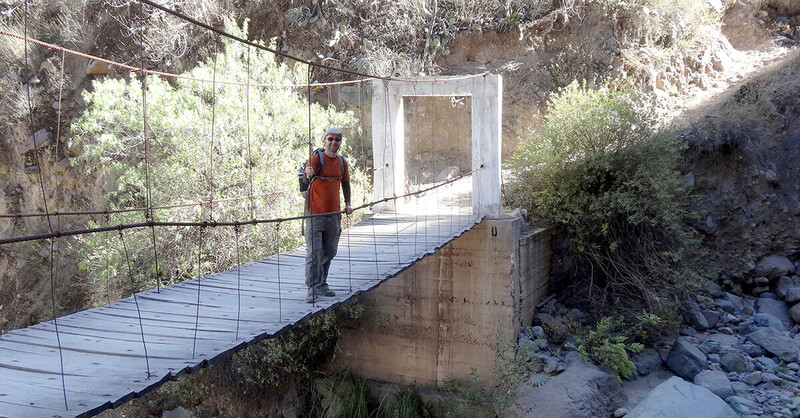 Continue to the wooden bridge across Rio Cabanaconde, and head toward the switchbacks to begin your ascent. The top of the Canyon is 4+ hours and more than 1,000 meters / 3,281 feet of elevation gain away. At the top, past the sign to Llahuar and Fure, the trail follows the Canyon rim. Stop at the Mirador Achachihua lookout shelter for one last look at the Canyon. Continue on the road, past an open-air bull ring and a football pitch, both to your right. Take Calle San Pedro to the town square. You have come full circle on your trek to Colca Canyon! There is no wifi or cell reception on this hike inside Colca Canyon. Download this comprehensive guide for your smartphone or tablet as an ebook. If your calf muscles are more tender than your ego, opt out of hiking to Cabanaconde and take a bus or pickup. Both take the main road and about an hour to get to Cabanaconde. To catch the once-daily bus, hike up to the main road and wait at the turnoff at noon. The ride is S/10 (USD3.05). Often tardy, the bus will arrive in Cabanaconde just in time for the 2:00 p.m. connection to Arequipa. On occasion, a 4×4 pickup goes up from Llahuar to Cabanaconde first thing in the morning. The Lodge owner will either offer the option or you can inquire. The ride in the pickup cost S/30 (USD9.15). You may be asked to help (un)load the pickup (our task was bunk bed parts). The view of sun rising above Colca Canyon is worth the labor. You can take in the attractions in Cabanaconde in an hour or so while waiting for the bus back to Arequipa. Cabanaconde’s sleepy main square is the liveliest part of town. Sit around to take in the local life, though that mostly consists of buses from Arequipa/Chivay arriving and departing. Worth a quick visit is the church, Parroquia San Pedro de Alcántara. There are a number of restaurants on and around Plaza Principal. Las Terrazas. Cheap mediocre eats, cocktails, an internet terminal. Sol y Sombra. 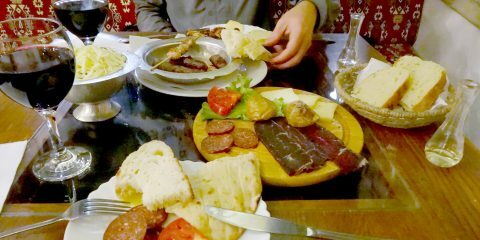 Traditional dishes, daily set-menu lunch. Kuntur Wassi. Hotel restaurant, decent Peruvian dishes. Pachamama Hostel. A backpacker classic. Helpful staff. 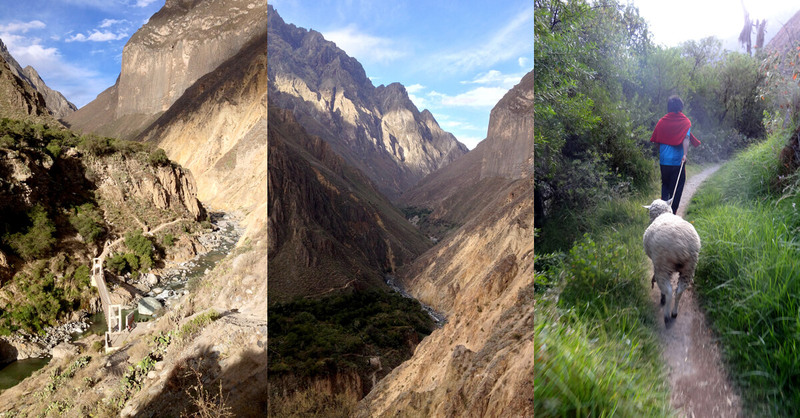 Tour and guide bookings (though of course, you’re trekking Colca Canyon on your own. Kuntur Wassi Hotel. Off-season discounts. Clean rooms with logs and boulders fashioned into furniture. Luggage storage. Reliable wifi. Schedules for buses back to Arequipa change so the following is only approximate. As with the ride here, check at the Arequipa bus station, or inquire at the hotels/hostels in town, or simply wait for the next bus. 6:30 a.m. / 7:00 a.m. / 8:00 a.m. / 9:00 a.m. / 10:00 a.m. / 11:00 a.m.
1:00 p.m. / 2:00 p.m. / 9:00 p.m. / 10:15 p.m. / 11:00 p.m. If you are not going to visit Colca Canyon, check out more of our photos from Colca Canyon in our Flickr album. Where in the World is Rawr? Wifi or cell reception are spotty to non-existent inside Colca Canyon. Get this comprehensive guide as an ebook for your smartphone or tablet—only $0.79. Way to go guys! Self-directed trekking and touring I am sure was a nice change from the tours in Chile and Bolivia. And you are taking more Spanish too!? You are forces to be reckoned with! We realized we like to visit places on our terms and timeline. Tours in Atacama and Uyuni were hard to avoid since you basically cannot do them on your own unless you have a 4×4. But anytime we can do something independently, we will! Spanish, yes! My goal was to get fluent by the time we leave Latin America. Not gonna happen, but we both made great progress (we’re reading books in Spanish now, for example). I can tell you, though, that the subjunctive in plusquamperfect made me feel less than powerful. I mean, en serio, ¡hubiera preferido hablar solamente en indicativo! Aw, thanks! We just finished our last week of taking Spanish classes in Arequipa. Colca Canyon was way cool, although there are benefits of going with a tour in that you often get some history and explanation. But every once in a while it’s fun to go alone. Not to mention cheaper! My husband and I are planning a self guided trek into the Colca Canyon, and in researching online, I came across your post. One question that I have is regarding the hostel, either Roy’s or Rivelino’s in San Juan de Chuccho. I can’t seem to find a direct contact to them online. Did you book ahead of time, or just show up? We learned about the two places in San Juan in a couple of blog posts about trekking the Canyon. Based on that info we just walked in. We must have been there in low season because we and another couple were the only guests at Rivelino’s. I think it depends when you go. Adventure says just show up. Safety says call ahead – I’d say travel agencies in Arequipa (there are quite a few) have phone numbers for both of these places. WOW! What an amazing experience! These photos blew me away. Was especially impressed by the one of the hot pool, sorry to hear it wasn’t quite as warm as expected, though. Thanks for sharing! Thanks, Dana. The hot pool may not have been hot, but boy, did it feel good to soak in it, at the bottom of the Canyon, after the hike! I like your blog, very nice written. Finally some great information about the DIY Colca Canyon. I have a question about the luggage? Where did you leave your luggage? Me and my boyfriend are thinking to arrive in Arequipa in the morning (around 8am) from Ica. We were thinking to go on a bus to Chivay and maybe spend a night there and take the early morning bus to Cruz del Condor. And then we are thinking to do the same trail as you did. Do you think it is a waste of time to spend a night in Chivay? We left some of our stuff at our hotel room in Arequipa, carried the rest on the hike. We did not go to Chivay. Don’t worry about not finding information online, just go to the bus station and ask. And blog about what you find out, of course. Very nice post. Since it seems as if there are only informations in english, I made a german post for those who are interested. thought I’d also share my trip to the Colca hope you enjoy. cheers! 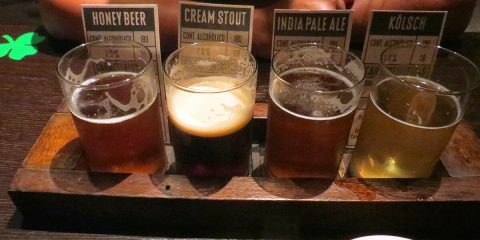 I wanted to share my blog post here, since it seems like there isn’t that much info out about doing this hike without a guide. We went to Llahuar for our first night and then spent the second night in the Oasis. 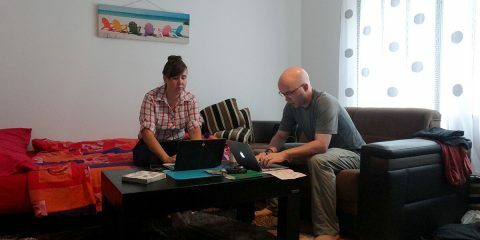 Your blog was lots of help planning our trip. Thank you! Thanks, Pech. Though these guidebook-like articles aren’t the easiest (or even our favorite) to write, they are helpful to people for all those reasons you mention. Hope you make it to Colca Canyon one of these days! Thanks for the detailed information 🙂 We prefer DIY treks too, though it’s sometimes really difficult when there’s very little information about the logistics around – Colca Canyon sounds like a great trek, we really love Peru and want to get back for some more trekking soon! Wow, going here without a guide is sound tedious, but I’m sure it was fun and you guys own an awesome experience. I’m also into trekking and I would love to trek here as well. I only have climbed mountains, but never been trekking to canyons like this. Thank you so much for sharing such a detailed post, this will surely help other travelers to go here as well without a guide. It isn’t tedious at all. You still have to do all the hiking even with the guide… We do hope this info helps! Sounds like an amazing hike. I haven’t been to Peru yet even though I live in Ecuador. I will definitely keep this trekking destination in mind when I go there. Thank you for giving such detailed information ? Glad to be of help. It’s not the easiest place to get to and explore, but it’s worth it! 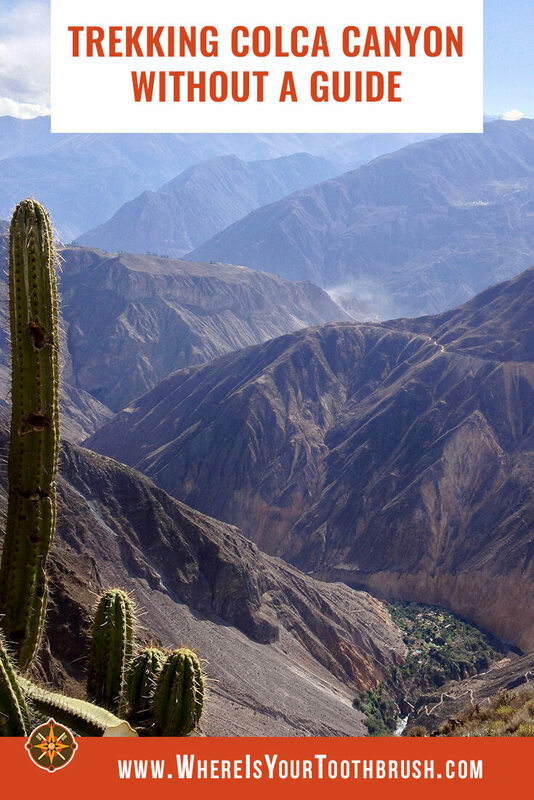 The Colca canyon trek looks like an epic one. I loved the rugged and wild beauty of the landscapes. The other thing I loved is the Llahuar lodge and its location. The views from the dining area seem to be awesome. The fact that the meal is vegetarian is another attraction for me too. What a trek! Great information too. If I were going without a guide, I’d definitely be scouring the webs for information like this. The views from that patio are stunning and I LOVE that not-so-hot pool, haha I like having step by step instructions for something like this so I know I’m on the right track because no one wants to get lost in the wilderness unexpectedly. So great job. Thanks, Hallie. There are few comprehensive guides to hiking in the Colca Canyon, and we’re proud to have written one of them. Sounds like such an amazing experience! I’ve heard nothing but good things about the Colca Canyon hike, but haven’t made it there myself. I’ve done the Inca Trail, but this looks like just as interesting of a hike, but in a different way. Thanks for the budget breakdown as well! It was quite memorable, yes. On the Inca Trail you just go up, here you go down first and have to get back up to the rim! Great detailed post! I’m sure it will be useful for people traveling to Peru. I’ve always wanted to go there. Thank you for showing what Peru has to offer. Where you stayed the first night seemed so real! I loved that you followed a boy with his sheep and then shared a bathroom with a turkey haha. Your insight made me feel like I was right next to you. I loved reading about your adventure in Colca Canyon…and I can’t believe how inexpensive it is. What a treasure! So glad you were able to experience the culture and beautiful landscape of this area without having to join a group tour. I was pretty impressed with the size of those cliffs and the steep descent you had to endure — that’s pretty hard on the knees! This is so brave! You are truly inspirational! I would love to hike this canyon! Thank you so much for this guide! I’m planning on doing this hike in May and this kind of information is invaluable. I’m curious if you booked for your accommodation ahead of time? I can’t find any way of contacting either of the lodges from the first night (Roys and Rivelinos). I’m slightly nervous about hiking down unprepared and not having a place to stay. We did not make any reservations, Sarah. I hear staff at the Pachamama hostel in Cabanaconde can make reservations for you, or for Roy’s email lacasaderoy [ at ] hotmail [d o t ] com. I’ve added a map on my blog and added a link to this page. Feel free to link back. Great post – very informative, thank you! I have a question remaining: would you say that it is safe for three young women (around 20 YO) to trek the Colca Canyon on their own? Thanks, Thalia. I would say yes, it’s safe for 3 women to trek the Canyon without a guide. There is no dangerous wildlife, the locals are friendly, and the only real risks are preventable if you take basic precautions you normally would as a traveler (or group of travelers) and follow the advice in this article, e.g. don’t do anything stupid, bring water, use sunscreen, look where you walk, stay on the trail and to the inside, rest, etc. Have fun! i repeat – great post – very informative. but let me know:i and my husband want to make Colca trek without guide too in the mid october. When taking local bus from Arequipa to Cabanaconde is it a problem to catch one without reservation in advance? Or just wait in the bus station?And is it safe ? As the journey is quite long is there some stops to go to the toilette for example? It depends on your risk tolerance and when you go. You can just show up at the bus station and get the tickets there and then for the next departure. If you are taking a super-early bus or are traveling during holidays or super-busy times, I’d recommend getting your ticket a day ahead of time, as we did (on the return trip we just bought the ticket on the bus in Cabanaconde). The bus stops in Chivay for about 10 minutes, that’s your opportunity to use a restroom. Do get seats on the right side of the bus as that’s where the Canyon will be. And the closer to the front your seat, the less bumpy the ride. Incredibly informative and comprehensive.. can’t thank you enough. Flying yo arequipa from cusco right now! We just finished hiking Colca Canyon and this guide was priceless. There’s one update that I think is worth making. Rivelino has added some modern rooms in San Juan de Chuccho under the name of Colibri Lodge. The rooms have nice mattresses and modern showers and wouldn’t look out of place in a hotel. We paid S. 130 for the room with a king and private bathroom, I think it’s around S. 180 online. Thank you, Sergei, that means a lot. And we’ll be sure to include the new info in the next edition of the guide for 2019. Yes, we did skip Mirador Cruz del Condor, but our guide includes instructions on how to incorporate it into your trip. We saw condors from inside the Canyon as well as from the rim. You can see the surrounding mountains, beyond the Canyon, from the rim. We did not seek out a specific spot for a best view. Sorry, I do not know this. Check at the Cusco bus station perhaps…?